Create a cute character and you can be pretty much set for life in Japan. With this in mind, whoever created Panda Z must now be sipping cocktails on some Caribbean island and fanning themselves with banknotes. Panda Z is an insanely cute parody of the classic giant robot show Mazinger Z, featuring a panda who pilots a giant panda robot, plus several other animal based characters. Like many franchises of this type Panda Z started off as merchandise before becoming anime, but with the financial clout of Bandai behind the anime series the amount of figures and toys has grown exponentially since it was released, which leads me to this figure range. 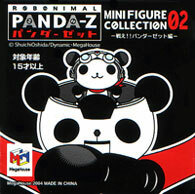 The range consists of five display figures based on characters from Panda Z, including Panda Z pilot Pan-Taron, inventor Dr Pan-Ji, the robot Panda Z itself and rival robots Moujumbo and Black Ham Gear. Each figure comes ‘blind boxed’ (meaning you won’t know what figure is in the box you buy until you open it), and, as with most figures of this type, required some simple assembly which equates to little more than slotting the pieces together. When constructed the figures stand at between 5cm (2") and 10cm (4") in height and are generally fixed in place with no poseability. Often the problem with these kinds of ‘pocket money’ figures (each one costs the equivalent of £2) is that they are based on detailed anime art and can’t always convey the necessary detail. However, Panda Z’s simple but striking colour schemes and chunky, bold designs provide the perfect antidote to this problem. Obviously it would be easy to be lazy when the style of the figures means it is hard to make them look bad, but instead these figures are great quality and some real thought has been put into their design. Each figure comes with its own piece of scenery which it slots into to create its own little scene, but what really is impressive is that the four robot figures (two of Panda Z, one of Moujumbo and one of Black Ham Gear) can be combined to create two mini-dioramas! The final figure consists of Pan-Taron and Dr Pan-Ji sitting by a pond and looks really cute, but it is worth noting that the pieces don’t fix in place. On the plus side this means they can be arranged however you want but on the minus side you can easily knock them over. The main problem though is the monochrome figures. Many Japanese figure ranges are lazily bulked out with unpainted or clear plastic versions of the existing designs, and this range is no exception. Basically there are two versions of each figure, one is full colour and one is monochrome, and considering they are blind boxed it’s pot luck whether you get the matching pairs. These monochrome figures are still stylish, but they just don’t have the visual impact of the colour ones. All in all though this is an excellent figure range, the sculpting and painting is excellent and some thought has been given to the pose and setting to bring the admittedly simple characters to life. The figures are all sturdy and designed without any easily breakable pieces, plus they look damn good wherever you display them. It’s a shame about the monochrome figures, although I suppose some people may prefer them to the colour ones their inclusion is the only sign of laziness in an otherwise excellent collection that really deserves to be purchased. Apart from the excellently sculpted scenic bases, which are part of the figures themselves, there is only the standard fold out leaflet that shows all the figures in the range.